The applause has ended; your instrument is back in the case, it's time to celebrate! You practiced hard, you played beautifully, and the music was a delight. Let’s celebrate with a very special, fruity, bubbly and delicious drink. The pineapple mimosa is made with pure pineapple juice and the freshly squeezed juice of orange and lemon. We hope you enjoy this crisp refreshing drink as much as your audience surely enjoyed your spectacular performance. This recipe calls for Prosecco, but if you prefer a softer drink, it will be equally delicious with dry sparkling grape juice. Just be sure it is well chilled! If you are looking at the ingredients and are wondering where to find honey syrup, it is easy to make: just mix equal parts honey and hot water, stir well, then cover and chill in the fridge. Freshly squeezed juice is an absolute must - your performance wasn't canned, and neither should your drink be. If you don't have a juicer for the pineapple, just look for 100% pineapple juice in the refrigerator aisle (not a juice blend). So, cheers to another recital season that came and is over! Just be sure your instrument is safely cased before letting that cork fly. Choose two tall champagne flutes in which to build the mimosas. Add the juice and honey syrup proportionally until the glass is nearly half full. Garnish with a thin orange peel. Cheers to a fabulous performance! 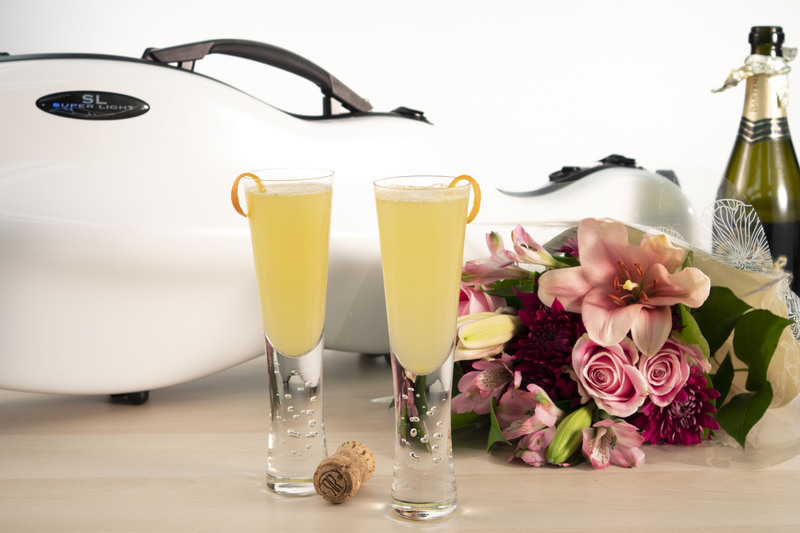 Thank you for joining us for the final installment of our spring recital-season drink recipes! If you missed any, just follow the link below. Also, if you are graduating this spring, perhaps now is a good time to drop some hints about that new case or instrument you've been eyeing - don't forget about graduation presents!